CT-C series hot air circulation drying oven uses a low noise and high temperature proof axial flow blower and an automatic temperature control system. 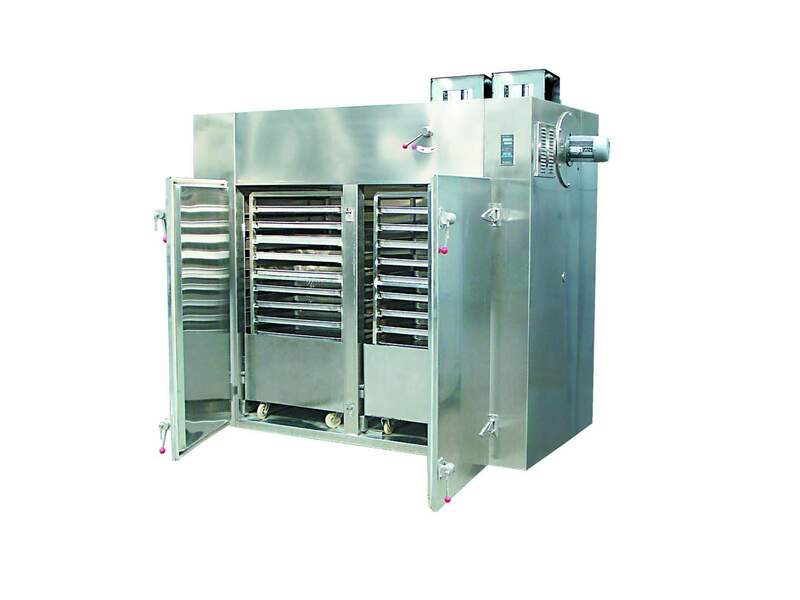 The whole circulation system is the fully enclosed to make that the heat efficiency of the drying oven increases from3 ～ 7% of the traditional drying oven to 35 ～ 45% of the present one . The highest heat efficiency can reach 50% . The successful design of CT-Chot air circulation drying oven makes that the hot air circulation drying oven in our country catch the advanced level both at home and abroad . In order to save a large quantity of the energy in out country , in order to enhance the economic results of the enterprises, in 1990,the medicine management bureau of the State issued the industry standard and the uniform type is RXH. It is suitable for heating and solidificating , drying and dehydrting of raw materials in pharmaceutical industry, chemical industry, foodstuff industry, agricultural and sideline products, aquatic products,light industry and heavy industry such as raw material medicine,Chinese traditional medicines, tablet of drink, immersed electuary, powder, granule, packing bottle, pigment, dyestuff,dehydrated vegetables,dried fruit and melons, banger, plastic resin, electric elements, drying varnish and so on. 2.Temperature for steam:140 ℃ -150 ℃ . 3.Temperature for electricity or far infrared:350 ℃ . 4.There are automatic and computer control system for customers to choose. 6.Power for electricity heat source will be 15KW calculated as Model I. Practical power to be used will be 5-8kw/h. 7.If any special requirements, please indicate it when order. 8.Parameters for non-standard ovens shall be discussed separately according to different conditions. 9.If the operating temperature is higher than 14 ℃ or lower then 60 ℃ , please indicate it when order. 10.The drying trollies and trays are of a standard size and can be exchanged with one another. 11.The size of drying tray:460×40×45mm. ◆ Most of hot air is circled inside the oven. The heat efficiency is high and the energy source can be saving. ◆ Using enhanced ventilation and adjustable air separating boards . It can make materials dried uniformly . The heat source can be steam, heat conductive oil, electricity or far infrared. ◆ The machine makes little noise and can be operated stably. The temperature can be controlled automatically and the installation and maintenance are all very convenient. ◆ With wide scope of application, it is suitable for drying varieties of materials. So it is a current type of drying equipment.